I first recommended MyLocalLookup last month in Local Search Directory Taps the Power of Television. If you haven’t already claimed your free MyLocalLookup listing it only takes a few minutes and is essential to growing your business. Why this particular directory is going to be wildly popular is explained in this post. In addition to these TV spots, both MyLocalLookup and their sister project BeyondtheTV are being prominently featured on the home pages of major networks. Where I live the networks regularly send their viewers to their sites especially during the Newscasts, causing these sites to have major and rapidly growing traffic which will continue to increase as the networks use new methods to lure their viewers onto them. 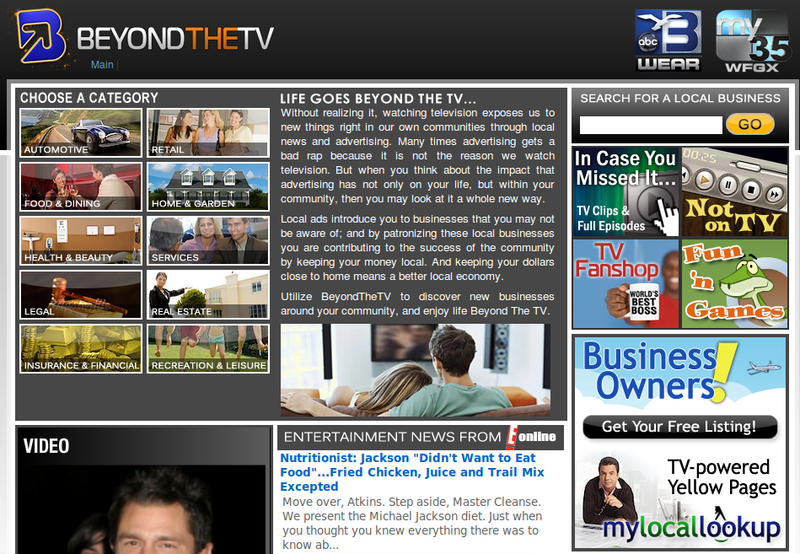 Remember I mentioned the prominent BeyondtheTV section in the screen capture or a TV station’s home page above? That takes the television station’s viewers to a Local page specifically for their area. 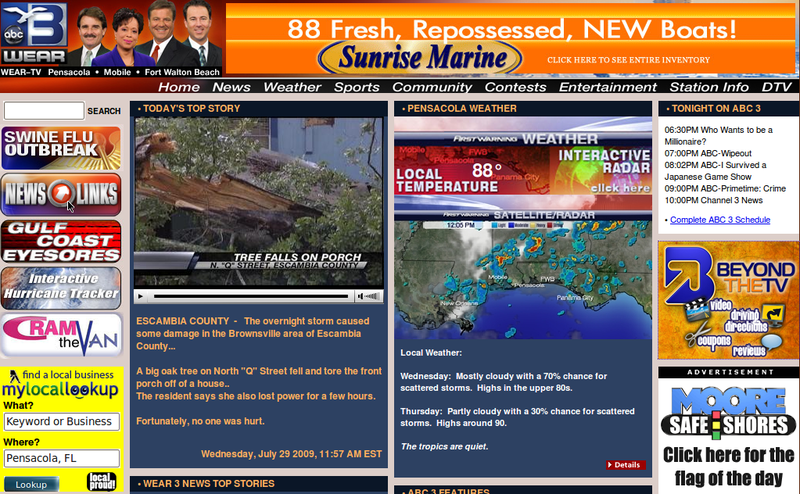 How popular do you suppose a page for your local area linked from the local television station’s home page will be? All of the Dallas TV stations now mention both Twitter and their Web sites regularly. Do yours? The evening news mentions them at the beginning and end of every broadcast and often during the news too. Do you suppose the station might mention the Local options too? I’m betting they do. Rev05 is measuring click through rates from the TV sites to the BeyondtheTV site of 10-25% resulting in from several hundred to 10,000+ unique visits per month. You can watch as their coverage grows and find your local market on the map. While only businesses advertising with the station are featured in BeyondtheTV, their promotion of the MyLocalLookup search box greatly increases how many use it – and use it regularly – driving new visitors to your listing there. Adding your business is fast and easy because all they need are your name, address, phone number, email and URL. Do enter your information for the free mylocallookup listing option now so you know you will be listed when mylocallookup rolls out in your area. Since this has never been done before no one can promise specific results and it will vary by business; however, there is ample evidence that the top listings in search engines consistently get the lion’s share of clicks with the top two listings receiving half of all visitors! I can tell when search listings for my favorite gift store drop out of first into second because visits and sales drop. Yes, it makes that much difference! Now is the time to consider whether paying a monthly fee to be featured at the top of the MyLocalLookup listings will be worthwhile to you. Each of these moves your listing to the top and adds more features. See the full descriptions of their three monthly payment options: Kite ($10), Glider ($25) and Jet ($100). Any one of these can ensure that your business shows up above the free listings on each search that applies to what you offer. Only you can decide if you want to indefinitely lock in that top position for your business at half the regular rate. This is the only way to do that. If they are already in your market that won’t take much thought. If they aren’t now, know that they cover 30% of the U.S. today, will cover 50% by the end of 2009, and expect to reach the entire United States by year end 2010. This offer is good for thirty days from today. It expires Wednesday, September 9, 2009 at midnight C.S.T. Questions? Comments? As always we encourage you to leave them in the comments here. You know we’ll get you the answers! Some great points on mylocallookup, I claimed mine and it definitely has helped my marketing strategy. Where is the link for free listing, i only found one link but the date mentioned there is already expired. I cannot see any other listing business for free link. Click the link that says free MyLocalLookup Listing at the very beginning of this post. I just tested it and it works for me. Only the 50% off the Jet special expired. Local search and MyLocalLookup are so important for one’s online business strategies… For the people who want to take advantage of the Jet Listing and 50% off – I’ve just reactived the discount for our friends at Growmap… Sorry for the hassles! Sorry for the delay – Please go to http://www.mylocallookup.com/advertise.php and use “growmap” as your discount code upon checkout. Well, if it is free of cost to put your company profile to this powerful directory then i have to make my mind to get stick with this right away, i will be back. Thank you for the comment about MyLocalLookup. We are currently offering our friends of Growmap a free listing. You can find the links within the article. I hope to see your business listed soon! MyLocalLookup looks really cool. I take a further information about it. Thanks for sharing the recommendation. .-= Tanmay@online survey ´s last blog ..Comparing psychometric test results between candidates =-. MyLocalLookup is one of the best things that have reached the internet. It makes online shopping much easier for me to do. By simply typing the keywords and my locations I now have a list of the nearest stores and other services that I need. Thank you for info ! !I’m thinking about majoring in communications to try and become a tv producer. I’ve heard t.v producers make up to 62,000 a year but I’m not sure if theyre talking about big time people like the producers on national tv station (ex CNN, ABC, NBC) I dont want to move out of my hometown of about 113,866pop ….how much would I make if I was the lead producer or assistent producer of a LOCAL telivision news show? what you say? .-= Ps2 cheats´s last blog ..Cheating for fun =-. If you really want to know I would ask the people at your local television station. Many of them will be on Twitter by now. If you want to stay in your home town I would definitely contact the stations there and ASK THEM what they most desire when hiring. It may be very different than what high school or college counselors THINK they want you to have studied. Best to find out now and not after you’ve spent years in college! They also might have opportunities to share with you – possibly internships at the station. You’ll never know unless you ask. I am doing some SEO services for a local salon in my area, so this seems to be a great addition to what I can offer them. I am always surprised at how many local businesses are not relying on online tools like this! I can see why the networks would be worried when the structure of their revenue streams have changed significantly in the digital world. It’s inevitable when the increased democratization of the commercial airwaves is driven by business models than by philosophical shifts and political tremors. While everything is changing television is still reaching a large percentage of people and can be used to introduce them to using the Internet and to send traffic to specific sites. I don’t think we’ll see regular TV go away just yet, but it probably is seeing a decline in revenue. This is fantastic. They should bring something like this out in the UK. The UK is usually the first country U.S. ideas spread to from here. If you know of any local search directories for UK based businesses do feel free to share them including links. This concept would be very well received in the UK. A very interesting idea! My locallookup is really going to work well for all those small business enterprises who can’t afford to have an ad campaign. Its really going to promote the business and its helpful i have seen people getting listed in such directories and benefiting from those. There are separate local directories presented all over the world so if mylocallookup is not present in your country you can opt for the one working in your country and city. .-= Chuck Brown@ Golf Swing Tips´s last blog ..Golf Swing Tips #1: Introduction =-. There are so many local search directories. I will be posting a great new shortcut for getting your business in over 40 in one go including the largest. Watch for that one in the next week or so. Have you visited the No Bogies blog? It would be a good place for you to comment and receive dofollow incoming links. They have some great posts on Golf Rules and Saving on Green Fees and Finding Golf Tee Times. .-= Alex Sysoef´s last blog ..The Keyword Minute Report by Brad Callen =-. Alex – what city are you in? Currently MyLocalLookup is in 44 markets across the country and growing… If we are not in your city yet, we will be soon! The video s very funny! Where you got that? .-= Reza@make money more online working´s last blog ..3 Tips to Make More Money by Online Working =-. The people at My Local Lookup are experienced videotographers. I signed up for the free listing, completed the form and now am waiting to see the listing online! We thank you for your recent submission into http://mylocallookup.com/ – Your listing has been approved and is up for search. We went in and added a few keywords for you – something we like to do for our clients. Good luck! Will have to look in mylocalLookup how much does it cost? is it us only? .-= gunnsy´s last blog ..Embroidered Polo Shirts smarten up your image =-. MyLocalLookup is a national directory associated with over 40 television stations and over 50 “Local” web properties. The cost to have the Jet Package is $100.00 per month, billed monthly and you can cancel at anytime with a 30 day notice. Through our affiliation with Growmap, we have offered their members a 50% discount on the Jet Package. This is an exclusive offer for Growmap clients and friends of Growmap only and is a limited time offer. Please feel free to email us at info@mylocallookup.com if you need any assistance. awesome post, and i like your recommendations about MyLocalLookup.. thank you so much! Thank you. I’m currently working on a post about a short-cut to getting your business listed in over forty directories. I’m sure it would really benefit your business. By the way, did you know your site was miscategorized at StumbleUpon as being about Graphic Design? StumbleUpon is an easy way to drive more traffic and far more effective than most other sites at sending a surge and then residual traffic over years. I submitted a category correction for your site and added a review of Deck Tile Direct” with an image. I’ll be writing about the most effective ways to use StumbleUpon and Twitter in the near future too. I like this recommendation. Most small businesses simpy don’t have the budget to afford radio/tv or simple pay per click campaigns. Let alone the time to manage them actively each day. There is a huge, growing trend among using local search as the catalyst to do business. I looked at this site on http://www.compete.com and you can see that MyLocalLookup get’s huge amounts of local traffic. If you had to pay for this traffic all on your own, you would be spending $5000/mo. easy just to show up in Google results. I love finding solutions like this, it’s a “get in front of the line pass for free”. Just do a few Google searches and you can see some pretty impressive local results. I see there are a couple options. I usually don’t buy the free stuff as having any value but here you at least get a listing in their directory. Do you know other directories like business.com charge $299/year and usually no results. Thanks for sharing. I think I’ll give the mid-level sign a try. Thank you for taking the time to comment. What makes this particular recommendation more compelling is the amount of growth they can drive. Within a day after the first post I did on MyLocalLookup over fifty new sites added their search box and they already had ten more stations in the works. Except for Bing it is unlikely that any other Local Search directories are getting regular television coverage – and that is what I expect to drive their growth far faster than the others. It doesn’t hurt that their search boxes are highly visible but not annoying. It really helps that their site is easy to use. Usability makes a huge difference to getting people to use a site and repetition keeps them using it. They have both going for them. Be sure to consider the long-term when deciding which level to select. If you have very little competition the lower or mid-level could work. If it is possible that eventually many other businesses will have results showing for your most highly targeted keywords you may want to consider their special offer to lock your business on top. I hope every business at least takes getting a free listing seriously. The people behind MyLocalLookup, BeyondTheTv and Rev05 really have it all together. They aren’t your average startup. Watch for other posts about the new community they just launched and how small businesses with the budget for it can get professionally produced commercials running on their local television station.